This egg-rich bread is traditionally served in Jewish households to begin the Sabbath. Try serving for breakfast with fruit preserves or slice thick and use to make superb French toast. Have liquid ingredients at 80ºF and all others at room temperature. Place ingredients in pan in the order suggested by manufacturer. Select dough/manual cycle (or choose white bread cycle if you want a pan loaf.) Do not use the delay timer. Check dough consistency after 5 minutes of kneading. The dough should be in a soft, tacky ball. If it is dry and stiff, add water, ½ to 1 tablespoon at a time. If it is too wet and sticky, add 1 tablespoon of flour at a time. At end of cycle, remove the soft dough onto lightly floured surface and continue with the Shaping, Rising and Baking directions below. See our Bread Machine section for more helpful tips and information. Hand-Held Mixer Method: Combine 1 cup flour, yeast, salt and sugar in mixing bowl; stir to combine. Add warm water and vegetable oil and mix on low speed. Beat 2 to 3 minutes on medium speed. Add eggs; beat 1 minute. By hand, stir in enough remaining flour to make a firm dough. Knead on floured surface 5 to 7 minutes or until smooth and elastic. Use additional flour if necessary. Place dough in lightly oiled bowl and turn to grease top. Cover; let rise until dough tests ripe. Stand Mixer Method: Have mixer fitted with paddle attachment. Combine 1 cup flour, yeast, salt and sugar in mixer bowl; stir to combine. Add warm water and vegetable oil and mix 4 minutes on medium speed. Add eggs; beat 1 minute. Gradually add remaining flour and knead with dough hook for 5 to 7 minutes, until smooth and elastic. Place dough in lightly oiled bowl and turn to grease top. Cover; let rise until dough tests ripe. Food Processor Method: Have all ingredients at room temperature. Add 1 cup flour, yeast, salt and sugar to processing bowl with steel blade. While motor is running, add eggs, water and vegetable oil. Process until mixed. Continue processing, adding remaining flour until dough forms a ball. Place dough in lightly oiled bowl and turn to grease top. Cover; let rise until dough tests ripe. Turn dough onto lightly floured surface; punch down to remove air bubbles. Roll or pat into a 12 x 6-inch rectangle. Cut into two 3 x 12-inch strips. Twist the strips together. Place in a 9x5-inch greased bread pan or on a greased cookie sheet. Cover; let rise until indentation remains after touching. For a shiny crust, brush with a combination of 1 slightly beaten egg and 1 tablespoon water. Sprinkle with sesame seeds, if desired. Bake in preheated 400ºF oven 20 to 25 minutes. Remove from pan; cool. *You can substitute Quick Rise (instant, fast-rising) yeast in place of Active Dry Yeast. When using Instant Yeast, expect your dough to rise faster. Always let your dough rise until ripe. Traditional methods: use equal amounts; Bread Machine: use ½ tsp Instant Yeast OR ¾ tsp Active Dry Yeast per cup of flour in your recipe. Visit our Lessons in Yeast & Baking for more information on baking. This recipe was featured at Food Wanderings. Delicious,it came out beautifully. No bread machine all by hands. Thanks for sharing! Love this recipe! Made it a couple times and I prefer to do it by hand over any electric options. I also bake at 380 degrees because my oven tends to be a little hot and I can cook it all the way through without burning the top. Very good. Thanks. Thank you so much for this recipe. It was great. I usually make sourdough bread that takes forever to rise so the first time I made this bread I didn’t realized that it was over ripe so the texture was not so great but the next time I remembered that it gets ripe very fast and it came out really pretty, good flavor and great texture. Wonderful challah recipe, only wish it was a little bit sweeter. Will be baking it to be used as sandwich bread going forward instead of my usual white bread recipe. Thank you! Great bread, but too salty. I would reduce salt by half for an ideal loaf. 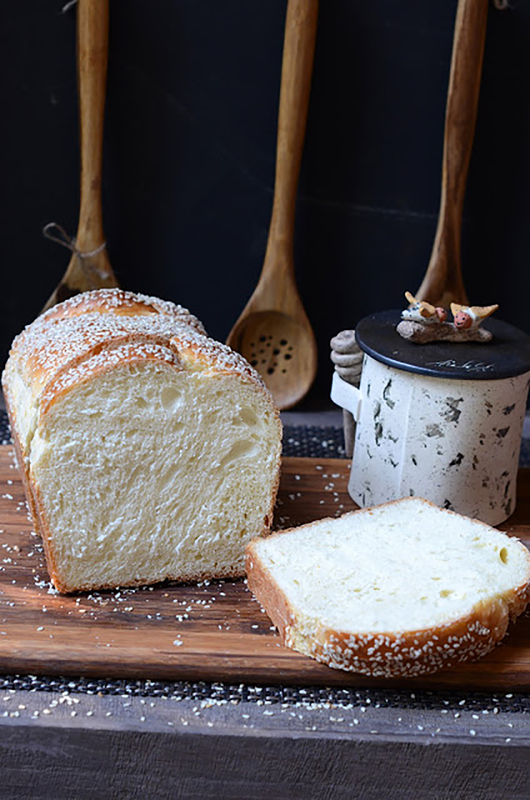 Can’t wait to try this recipe but I would like to bake it in a loaf pan, like the picture. Will I need to adjust the temp and baking time? The recipe has directions for baking in the loaf pan. Happy baking! The challah turned out great on the first try! Thanks!